The 12-Box Unit for outdoor centralized mail delivery. 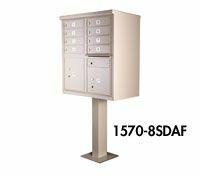 USPS approved to the F Specification, made entirely of aluminum stainless steel, Cluster Box Units (CBUs) are accessed from the front through an easy-opening master door gate assembly with a built-in open hold open device. CBU�s come in 12-, 13-, and 16-address models offering individually lockable front access doors made of extruded aluminum, and include out-going mail receptacles and parcel lockers in one durable and self-contained unit, mountable on the optional pedestals or a base of your choice. All prices include pedestal. Parcel Compartment Heights: 10 1/4" & 13 3/4"